The views are worth the hike at Davis Mountains. Whenever temperatures cool down and skies look clear, park hosts Virginia and Waymon Gill of Amarillo often pull on their hiking shoes and hit the trails at Davis Mountains State Park in West Texas. They especially enjoy time spent along a recently opened 1.25-mile loop in the Limpia Canyon Primitive Area. Hiking’s a big draw at the 2,700-acre park, where some of the nearly 17 miles of rugged trails also cater to equestrians and mountain bikers. Rocky paths wind up steep slopes, through stands of tall native grasses and across mountain plateaus. From scenic overlooks, you can see the nearby McDonald Observatory, Mount Livermore (the highest peak in the Davis Mountains) and the jagged Chinati Mountains, stretched across the horizon some 60 miles away. Over in the main park, a popular hiking trail starts at the interpretive center and ends at the historic Fort Davis National Historic Site, which preserves the frontier post that once protected the area from Indians. To shave three miles off the 4.5-mile route (one way), drive up Skyline Drive, park your vehicle and take off from atop the mountain. For a less-strenuous outing, tour wildlife exhibits and do some bird watching at the interpretive center, where you’ll glimpse scrub jays, curve-billed thrashers and white-winged doves. Montezuma quail — year-round residents — often show up at the park’s feeding station. In the morning and evening, small herds of javelina and mule deer often wander through the park. Campers have their choice of primitive sites or campsites with full hookups or water/electricity only. 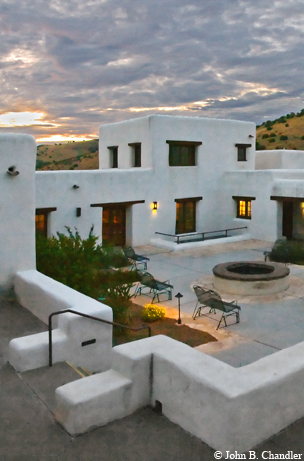 If you’d rather not rough it, book a comfortable room at the pueblo-style Indian Lodge, built in the 1930s by the Civilian Conservation Corps.